I know right? All this foreign language is annoying me. I get updates and come here thinking I'm going to see useful information and it's all gibberish. Yes, this is meant to be an English-language forum if for no other reason than otherwise people's posts will simply get ignored by the vast majority of users so they won't get any useful responses or feedback here. I have just opened the 'International' forum to other non-English languages to see if that helps, and moved the Persian translation posts there. @andrewilleyPersian losses in the program are a few mistakes that we have solved here and we do not have a question from the association. We also ask questions in English, so it's not a concern, the result of this cooperation was that the Persian language was almost completed in a few days, as well as for I appreciate your decision for Persian language forms. @Panda PatéticoI apologize for this, but we had to speak Persian in order to resolve some of the bugs, and if we have questions, we will always speak English. If I play podcast again and lock the screen for a long time it happen again but not happening while playing music even if the screen is lock for more than 20 minutes. Stick to 192khz (or lower). Higher freqs are not defined properly by qualcomm code (affects Hi-Res + DVC on Pie only). @maxmp The lockscreen issue I reported earlier, seems to be fixed in 808. 1) @0:11 The screen doesn't auto-scroll down for the first song to go below the display. It remains hidden behind the "mini player". 2) @0:24 Changing songs (left/right swipe) using the "mini player" on the album/list screen results in the player remaining on the list you originally entered from. Shouldn't the list change to the album of the current song? 3) It would also be great if there could be an option to go back to the player when tapping on the currently playing song from the list. Thanks for all your hard work and updates! @maxmpHello, Persian language has a bug fix that was fixed and another part of the program language was translated. I hope you apply this change in the next version. Thanks for your hard work. Is that possible to make buttons for rewint 10 sec and 1 min back and forward? Very useful when listening long podcasts. Stick﻿ to 192khz (﻿or lower﻿). On Samsung S7 Android 8 this effect can be heard with low sampling rate. But not to worry, we can live without DVC. Is there an issue only with galaxy s7 qualcomm? I just insalled new version on exynos galaxy s7. I see that HiRes is enabled with 192Khz. Previously when HiRes disabled, volume was less. Now w or w/o HiRes volumes are almost same. Confirmed - when swiping to other list the original list in the main window stays. But tapping the mini player puts it right. This was an issue even in the previous version of app, on my device running Android Pie. 1. Global DVC setting disables DVC for all outputs. 2. Thanks for the report. No, this is for "official" Pie ROMs only. It won't change lists (besides, esp. for shuffle modes, that list can be far far away from the category you're in), but you can always long press mini-player to sync category/track. @maxmp Mr. Petrov, thank you for all the hard work you are doing. I want to ask a question. I have a Android One 3rd gen device. 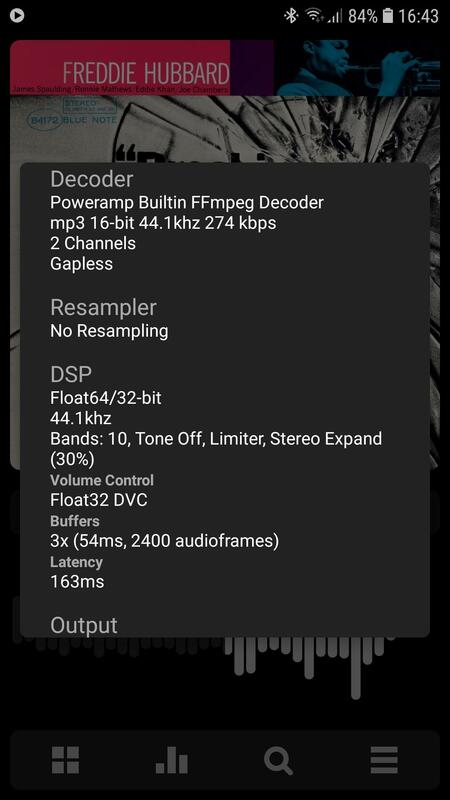 It supports Hi-Res 24 bit/192khz audio output but only in Marshmallow. I am on Nougat currently. It gives me error when i plug my headphones. My question is, is there a problem in android system that blocks 24 bit audio offload? In build.prop, there is "24 bit audio offload enable" string. Thanks again for your all efforts. Have a nice day. Now skip album with double press on BT buttons is working again!! @maxmp I have a Android One 3rd gen device. While such devices usually support hi-res in hardware, Android One is close to AOSP sources and doesn't include Qualcomm (QAF) patches and configs to enable hi-res. Same applies to Pixel line of devices, which also have the perfectly capable hi-res hardware, but software doesn't include support for that. Thanks for the reply and the great product!